March Contest Reminder - Memorize Your Lines and Try Not To Bump Into the Furniture. 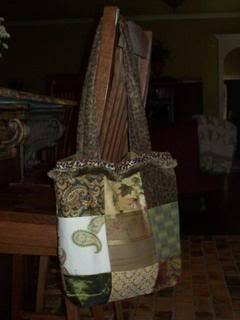 It's my newest bag pattern! An original that mah brilliant mother helped me to create. So cute, don'tcha think? I'm carrying this one as my purse right now. So, friends list: Make me laugh! Hey, that's pretty simple. I'm totally an easy room. I got nuthin. Stressful life is stressful lately. Tho, I do have a cute thing from my kid! Maddy has started to look at me and pat her pelvis, indicating that her diaper is wet and needs to be changed. And if I don't get it right away, she will add an insistent "uh oh!" and pat it again.